My friend Michelle sends out an email every Sunday with her weekly meal plan. I recently got on her distribution list and have learned of some new recipes I'm eager to try. 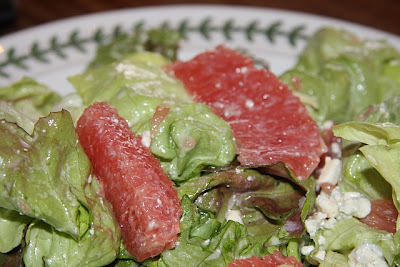 Last week she mentioned a salad with grapefruit which caught my eye since I've been getting such juicy grapefruits at the grocery store lately. I used blue cheese per her suggestion and a quick vinaigrette I learned from my friend Tara. Loved it. Put dressing ingredients in a small jar and shake vigorously to combine. Slice the peel off the grapefruits, making sure to remove all the white pith. Cut grapefruit segments free from membranes. I was browsing "stationary" on the internet and somehow stumbled accross your blog yesterday. I LOVE it, and I'm trying this recipe today. I can't wait!